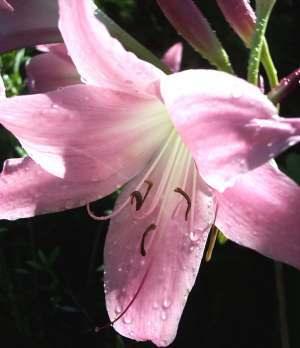 Amaryllis - Belladonna Lily - Seldom bloom in our gardens. A beautiful and fragrant addition to your garden. 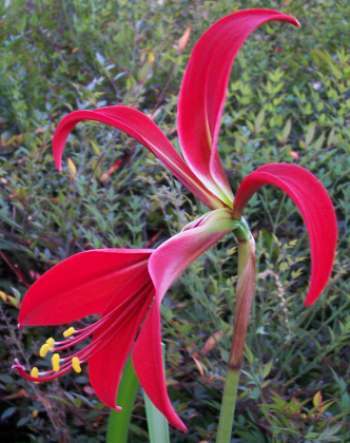 This robust bulb can grow foliage to 4' high and 4' to 6' wide, forming large clumps with age. It bears its large, rose-pink flowers on 4' to 5' stalks from late spring to early fall, with a peak in mid-summer. Grows in full sun to half-day sun. Looks best if given a deep watering every two weeks during a dry summer. Galanthus sp. - Snowdrop - NOT RECOMMENDED - Plant Leucojum aestivum instead. Habranthus robustus - Giant Pink Rain Lily - Perennial Bulb - Our native Prairie Rain Lily* bears white flowers a few days after thunderstorms. It is so common, some even consider it a weed, especially when it occurs in a lawn. This species, from southern Brazil, blooms likewise. However, its blooms are larger, pink and are borne on taller stalks. Though the specific name is, robustus, 'robust' in Latin, it is not the most robust one available. Some selections of Habranthus brachyandrus are more robust, as is the cultivar, Habranthus robustus 'Russell Manning'. All of these pink Habranthus, as well as their hybrids, grow in full sun to half-day sun in well-drained soil. All expand to form clumps both by branching and division of the bulbs, as well as by the germination of seed (except sterile hybrids), giving you a surplus to share. * It is known by two names, Cooperia pedunculata or Zephyranthes drummondii. 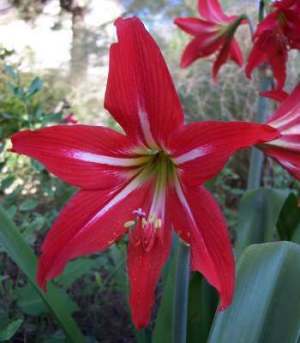 This is the first known "Amaryllis" hybrid, dating from the early 19th (or late 18th ?) century, presumably from the Lancashire garden of a Mr. Johnson. This plant is seldom offered for sale, being distributed almost exclusively by generous gardeners sharing divisions. If you happen to acquire one, plant the bulb 4" to 6" deep in a well drained site, ideally where it will receive shade after 3:00 PM. The bulbs endure our extremes of climate very well, going dormant after the first hard freeeze and during prolonged summer droughts as well. Often, bulbs sold as this cross are actually the related Hippeastrum X ackermanii, (Hippeastrum aulicum X Hippeastrum x johnsonii) which is also an excellent ornamental. Hymenocallis 'Tropical Giant Sister' - 'Tropical Giant Sister' Spider Lily - Perennial - Blooms earlier than 'Tropical Giant'. Nothoscordum - False Garlic - Perennial - Toxic leaves and bulbs! Sprekelia formosissima 'Orient Red' - 'Orient Red' Aztec Lily, Jacobean Lily - Perennial - One of the most spectacular flowers one can cultivate in San Antonio. This form is much more floriferous than the typical selections.